ABBEVILLE, S.C.—You don't have to search very far to find applications that hose manufacturers Hi-Tech Duravent or Hi-Tech Medical serve. Hoses for vacuum cleaners? Check. Automobile engines? Check. Air purifiers? Check. Medical equipment? Check. Leaf blowers and lawn mowers? Double check. That doesn't include hoses utilized for such intricate applications as air, dust and fume removal, milking cows, or pellet or pill transfer. Both firms make hoses for those markets, too. That diversity in the marketplace represents good news for the Abbeville-based companies, which are owned by London's Smiths Group P.L.C. The best news for the companies? Officials believe many more opportunities abound, some of which haven't been uncovered just yet. The Flexible Solutions Group includes six brands: Hi-Tech Duravent (flexible industrial thermoplastic hose and ducting for air, dust, fume and light material handling); Hi-Tech Medical (medical hose products); Flexible Technologies (hoses for home appliances, including vacuums); Flexschlauch Produktions GmbH (industrial hose and ducting distribution); Flexible Ducting Malaysia (medical and home appliance products for the Asia market); and Titeflex (PTFE tubing for the transportation and industrial markets). According to Costantino, the Flexible Solutions Group manufactures about half of its hose and duct products for the industrial sector. Medical and automotive account for 20 percent of the business, with floor care at 10 percent. The executive believes that the industrial, medical and automotive sectors have the greatest potential for growth. Tony Costantino (left), director of sales for Flexible Solutions, and Jim Malone, national key account manager, pose at the Flexible Technologies manufacturing plant in Abbeville, S.C.
One of the biggest areas of growth has been in the medical field, specifically in the production of hoses used in continuous positive airway pressure devices, commonly called CPAP machines, used in the treatment of sleep apnea. According to the American Sleep Apnea Association, about 70 million Americans suffer from the disorder, in which a person's breathing is interrupted during sleep, preventing the brain and the rest of the body from getting enough oxygen. Untreated, the organization says that the condition can cause health problems such as diabetes, high blood pressure, strokes and heart disease. The burgeoning market for CPAP machines—and more specifically, the manufacturing of the hoses used in the devices—has created a boon for Hi-Tech Medical. More than 3 million cases of sleep apnea are being diagnosed each year in the U.S. alone, according to the Mayo Clinic. And it is becoming more of a known health condition in emerging markets such as Europe and India. That demand is part of the reason that the Abbeville facility runs 24 hours per day, seven days a week, for a majority of its products. It took several years, two major acquisitions and a $2 million renovation over the past five years, however, for the Hi-Tech Duravent/Hi-Tech Medical brands to get to the point they are today. Flexible Technologies, founded in Guilford, Conn., in 1947, opened its 350,000-sq.-ft. Abbeville facility in 1964. Smiths Group acquired Flexible Technologies in 1991, and three years later Flexible Technologies acquired Duravent, a Kent, Wash.-based hose plant that focused on the industrial market. In 2005, Flexible acquired Georgetown, Mass.-based Hi-Tech Hose, which had been founded nearly two decades earlier in Santa Ana, Calif. Hi-Tech Hose was merged with its Duravent business, creating Hi-Tech Duravent. At about that time, Flexible Technologies spun off Hi-Tech Medical, providing emphasis on the medical sector that is booming today. As medical production shifted to Abbeville in 2008, the former Hi-Tech Hose plant in Georgetown was closed. 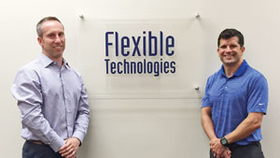 In 2009, Flexible Technologies purchased a vacant, 60,000-sq.-ft. facility across the street from its Abbeville plant and relocated its Thermaflex flexible duct systems manufacturing business there. Thermaflex, part of Flexible Technologies' Construction Products Group, produces residential and commercial heating and air ducting. That freed up 50,000 additional square feet in the main plant to accommodate production transferred from the former Hi-Tech Hose plant. Today, the Abbeville facility serves as the global headquarters of the Flexible Technologies Group, including engineering and research and development. The group employs roughly 430, of which about 250 work in Abbeville. The rest are divided among a second Hi-Tech Duravent facility in Plymouth, Ind. ; Flexchlauch Produktions in Lubbock, Germany; Flexible Ducting Malaysia; and a distribution center in Mississauga, Ontario. Costantino said that transition was challenging. Costantino said the company has emerged better from the experience. He said fierce competition led the team to question its performance both from an availability and quality standpoint. “We went through a period of time during the transition where we had long lead times. We couldn't get orders out the door to customers in a timely manner, and that started to change,” Costantino said. Costantino credits the firm's core stocking program—in which the company guarantees that a large group of its products are available and ready to ship in a timely fashion—for helping to right the Hi-Tech Duravent/Hi-Tech Medical ship. 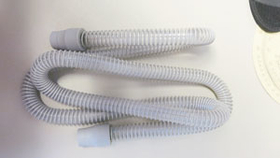 A hose for a CPAP machine, which is used in the treatment of sleep apnea. 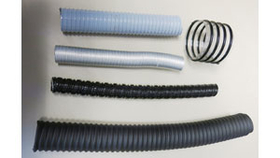 Hi-Tech Duravent produces hoses for almost every major vacuum cleaner manufacturer, and its hoses are sold by national distributors Grainger Industrial Supply and McMasters-Carr. Costantino believes the industrial and automotive markets will continue to grow, rivaled only by the growth in medical. “Things definitely seem to be turning around and heading in the right direction,” he said. The key, he said, is for the company to find new avenues for products in the automotive and medical sectors. While sales figures were unavailable for the individual companies—Smiths reported revenue of $3.3 billion in 2014, with Flex-Tek accounting for $282.7 million of that—Costantino said sales have exceeded expectations for several years. “It has enabled us to grow from a manufacturing standpoint, and it has enabled us to grow our sales force because the more that we can get out in front of people and show them how we can help them solve issues that they may be having, we find more and more opportunities,” he said. The key, he said, is listening to customers. “We know we can we get better,” he said. 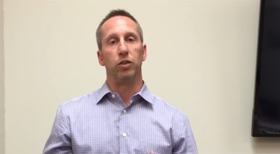 “We have to continue to get out in the market, listen to our customers and take the next steps to continue to improve, whether that's from a service standpoint, a product and development standpoint, maybe see changes where the market is going.